The official opening of the terminal took place on 8 September, performed Minister of oil and energy Bjartmar Gjerde and Gordon Goering, Phillips Petroleum’s managing director in Norway. The first gas reached the NorSea Gas Terminal on 17 September 1977 - three days after it had entered the pipeline at Ekofisk. Bringing the oil and gas to shore in Norway was not technically feasible in the 1970s, largely because the Norwegian Trench was too deep to be traversed with a pipeline at that time. The end station for Norpipe’s 443 km, 36ʺ gas pipeline was therefore Emden in northern Germany. Construction work started in the autumn of 1973. Until the terminal was opened in 1977, the Ekofisk gas was reinjected in the reservoir. The first sales agreement for gas from the Norwegian shelf was signed in 1973 between the Norwegian Phillips group and a consortium that consisted of Ruhrgas in Germany, Distrigaz in Belgium, Gas de France in France and Gazunie in the Netherlands. The sales agreement with this consortium of gas buyers on the Continent was one of the main reasons why Emden was chosen as receiving site for the pipeline. The new pipeline was the world’s longest welded pipe structure, with two compressor platforms for pressure support. 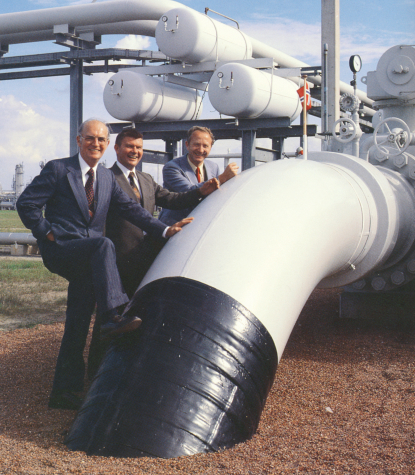 For a number of years ConocoPhillips operated both the pipeline and the terminal. From 2005 to 2007, the Gasport company ran the terminal. This company was owned 50/50 by ConocoPhillips and Statoil. For the last ten years, the state-owned company Gassco has operated the pipeline and the terminal in Emden on behalf of Gassled. A new receiving terminal opened in Emden in May 2016, replacing the original one from 1977. The new terminal is well adapted to future needs for reception and distribution of gas from the fields in the Greater Ekofisk Area as well as other fields on the Norwegian shelf that transport their gas through Norpipe. From the beginning and until today, more than 250 billion standard cubic meters of dry gas have passed through the Norpipe pipeline to Emden and then on to gas customers in Europe.